You simply must tour this absolutely fabulous condo in Historic Cherokee Triangle! Move-in ready, circa 1890 landmark underwent a complete, professional renovation in 2013, providing the perfect mix of high-end modern amenities and finishes blending with the architecturally correct features that can only be found in a building of this era! High ceilings throughout, lots of windows and natural light, beautiful inlaid hardwood floors, two fireplaces with ornate mantels and trim. Spacious and inviting living room with authentic turret, opens to an awesome covered balcony (10x14)to lounge on during those lazy summer evenings!Living room adjoins banquet-sized dining room, leading to an amazing eat-in kitchen featuring exposed brick wall, granite counters, enormous raised snack bar, cherry cabinets(some with lead glass doors), pantry cabinet, stainless appliances, and pendant lighting. A butlers pantry connects the kitchen to the laundry area and 1/2 bath. Master suite with walk-in closet and private bath (marble flooring, walk-in shower), two additional generous sized bedrooms (3rd bedroom off living room also makes a great home office), and 2nd full bath (all ceramic and marble) complete the living space. Dual HVAC systems, additional basement storage, 1 car garage space (garage recently re-built) and extra off-street parking space. Additionally, building recently tuckpointed, painted, and fencing installed. Monthly maintenance fee of $300 includes master insurance, water and sewer, trash removal. What a fantastic location! 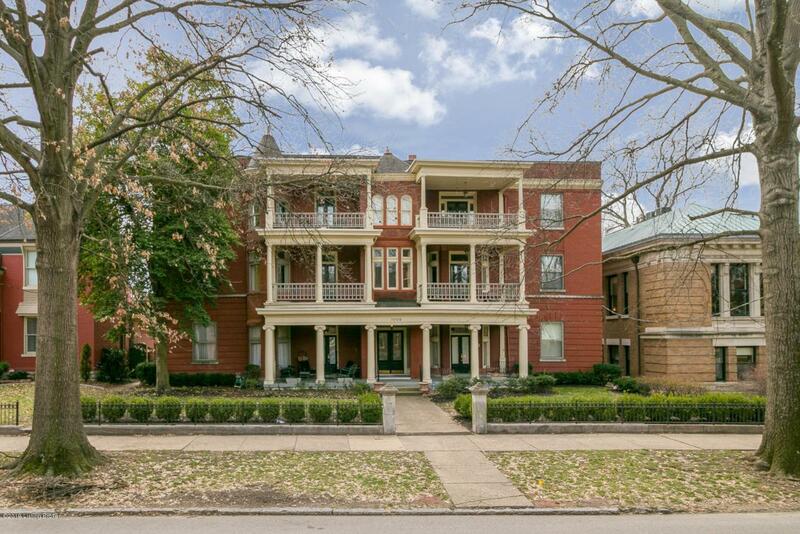 Steps to Cherokee Park, and all that the Highlands/Bardstown Rd has to offer; dining, shopping and nightlife abounds, at your fingertips! Truly the ultimate in condo living!